I got the camera out today while beating the boy into doing his math homework. This is the first, and lonely, double eyelet rib sock. 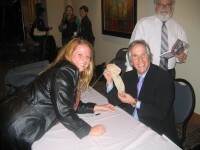 It's the same one that Henry Winkler held for me. I need to re-do the cast off because it's a bit tight for my shapely calf. I should know better and just use EZ's sewn cast off for toe-ups all the time. 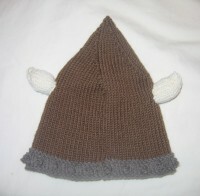 A rather dull and lifeless picture of the baby viking hat. Super easy knit but I think I would flatten out those crown decreases a bit near the end to make it a bit less pointy. Check out Bella Knitting for the pattern. But maybe wait a couple days - their website is down for some reason. It's made out of Brown Sheep Lamb's Pride Worsted, held double and following this pattern, which I found through Dave of Criminy Jickets. Yes. It is indeed Home Depot Orange. No. It is not for anyone I know. 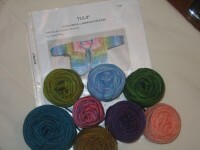 I finally picked up my Tulip Baby Cardigan kit from Make 1 Yarn Studio. It's really precious! Now all I need is for someone to have a baby girl and I'm off to the show. 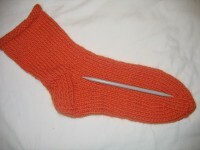 I was distracting myself recently by searching for sock inspiration on Ravelry. When I saw this free pattern I fell immediately and madly in love. 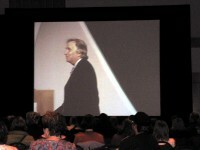 So I followed the link to the designer, Darlene, of Northern Sunshine Designs. This is one talented lady! Gorgeous sock patterns using truly lovely yarn...and both on special. What do you think happened? This is an unusual base: 50% wool, 20% mohair, 20% silk and 10% nylon. The colours are truly beautiful, with nice intensity, depth, and attractive blending from one shade to the next. The yarn has a pretty sheen and I think will develop a pleasant halo when washed. It is machine washable. My only complaint is that these skeins are twisted and tied TIGHT. So tight in fact that the yarn has been quite compressed in places. 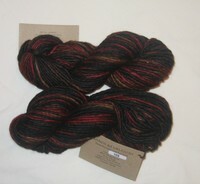 I think I might open them up and re-skein them just to let them relax a bit. 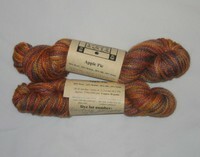 "Sunrise" Apple Pie sock yarn, by Apple Laine. The colours are bright and happy. I love them unreasonably. Oh... and 5 sock patterns. 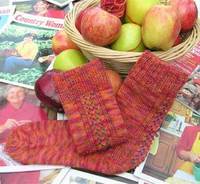 The Apple Harvest socks pictured above, and 4 others. It was a SALE! You would have done the same. 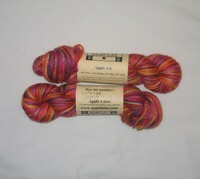 8 skeins of Manos del Uruguay worsted in colour 150 "Lava". It's black with red and taupe. Really striking. This pic doesn't begin to do it justice really. I'm going to make this cardi with it. I'm so glad that December is nearly here. Both University and Work have lightened up and I may actually get to knit something in the next month or so. Wish me luck! Still trying to knit once in a while. Work has been brutal. I easily pass by a 60 hour week with most of Friday left to go. I have an ENORMOUS work load at school, 3 children, a husband, and a master's level course at university. It really hasn't left much time for knitting, or for taking pictures of knitting. I did finish the first double eyelet sock; the one that Henry Winkler so kindly held, but have yet to cast on it's mate. I also knit a baby viking hat. That's it. The sum total of my knitting production since the middle of September is one sock and a baby hat. Pathetic. Still, I remain hopeful that things will calm down a tiny bit between now and January. There's every reason to think that might happen. I'm done first term report cards now, and all of the government assigned felder-crap is behind me. The big literature review assignment for my course is done leaving readings to do but nothing intense again for a little bit. My ankle is healing slowly enough that I'm still not even tempted to try to go work out at the gym. There should be time enough to knit that other sock anyway. Christmas knitting? Only 1 project. Big secret. But I've kept it small to improve my chances of actually doing it. 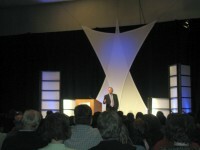 Will try to stay in touch better here too, and to put up some pictures for you next time. Be well all. He listens to rock and roll or hip-hop or rap or jazz or swing and 155mm howizitor. Because he is working or fighting from before dawn to well after dusk. He digs foxholes and latrines and can apply first aid like aprofessional. He can cook his own meals, mend his own clothes, and fix his ownhurts. And death then he should have in his short lifetime. For friends who have fallen in combat and is unashamed. of going to War when our nation calls us to do so. My Air Cadet friends who went on to serve, especially those who flew sorties out of Germany during the Gulf War. My friend Africa, and all civilians who have chosen to put themselves in harms way to do a job. Every family member and beloved friend who has ever hugged someone goodbye, held back tears, and watched them board a plane to take them halfway around the world.